Increase sales – New customers! Approximately 95% of the world’s population and 2/3 of the purchasing power are outside US borders. Diversification – Customers in international markets mean your business will be less vulnerable to downturns in the US. Sell excess production - for human consumption instead of animal feed. 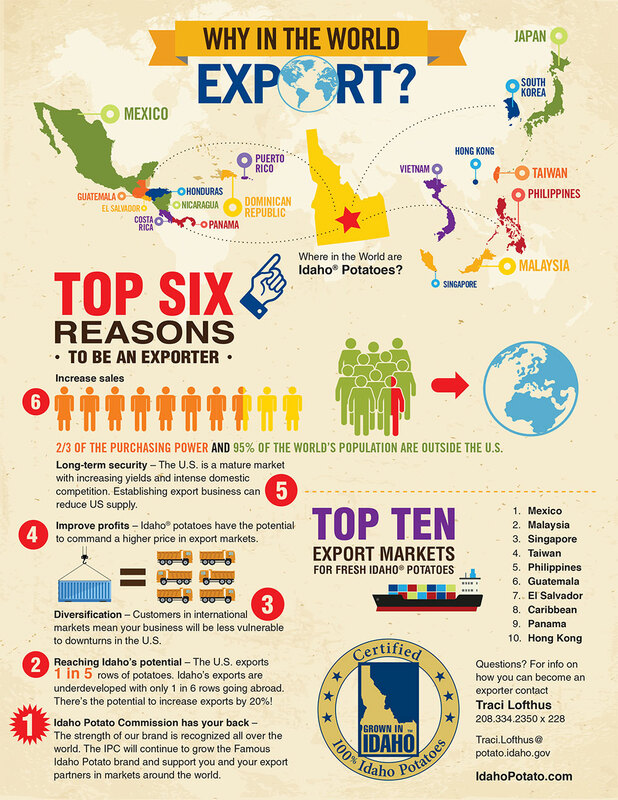 Idaho Potato Commission has your back – We will support you and your export partners in marketing endeavors. Premium products - US Ag products are recognized as high quality products around the world – and almost everyone has heard of Idaho® potatoes. Competitive strike – Our neighboring states are big players in the current export markets. It’s time to up your game in the global playing field.